Sometimes a new idea turns out to be a fabulous experience that must be repeated annually. So it was for our 1st Rum Runner hash! 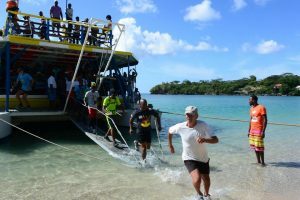 A group of 250 hashers boarded the Rum Runner on Saturday afternoon and travelled to a secret location for a hash. The boat finally stopped at BBC beach and after a quick briefing from the hares, hashers poured down the gangway onto the beach to the familiar war cry of On On. The hash was short but with some killer hills thrown in just so we could all admire the views. Food, drinks and a wonderfully cool beach swim were all waiting for us after the hash. 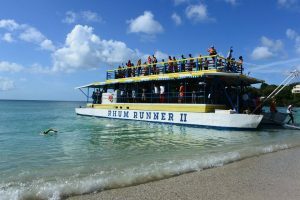 After a brief lime at BBC beach, hashers returned to The Rum Runner and we spent an enjoyable couple of hours having a hash party on board while the boat cruised the coastline of Grenada.